Dropping from Arts Faculty Leadership to 0.6 p/t teaching three years ago allowed me to immerse myself into making my own work again. 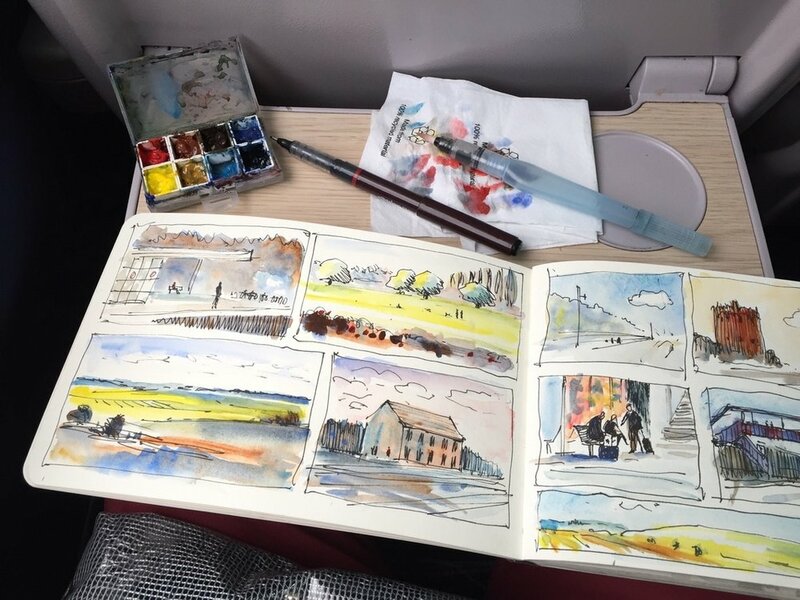 Joining the Sketchbook circle has been really helpful in making sure I keep going and it is keeping me connected with others across the country who are juggling their lives and their time yet are determined to make their own creativity a priority. In addition I have had a joint residency opportunity over the last year with Emma Taylor at Sussex Prairies, an RHS partner garden in West Sussex. This has culminated in an exhibition entitled ‘Fleeting Moment’ which continues until mid October this year. I have discovered that having deadlines to work to is key. Responsibility to others helps me to keep going and makes sure I meet challenges in my own work. I have gradually become confident enough to call myself a mixed media and textile artist and believe that collaging and assembling materials whether paper or fabric based is at the core of everything I want to make. In the sketchbook circle books I can see an annual increase in my ability to loosen up and to work without fear. In my residency work I have built a body of work which includes 5 series each containing 6 works. A series of photographs recording shadow play in pressed leaves from the garden. A set of screen print collages where I have assembled pre prepared coloured papers, personal photographs, and drawing materials onto screen printed backgrounds. A series of plant dyed fabrics which have been arranged and layered before drawing and embellishing with running stitches. An installation which shows the different experimental processes I have researched and practiced and various journals which show another record of my residency journey. The residency has given me a unique and vital opportunity to make the commitment to making my own work again, explore new ways of working and engage in subject matter which has become extremely important to me. I have responded instinctively to the prairie surroundings. Collecting and preserving plant life has been continuous and led to research into natural dye processes, recording through photographs, notes and sketches, leaf rubbings and teaching myself screen printing. 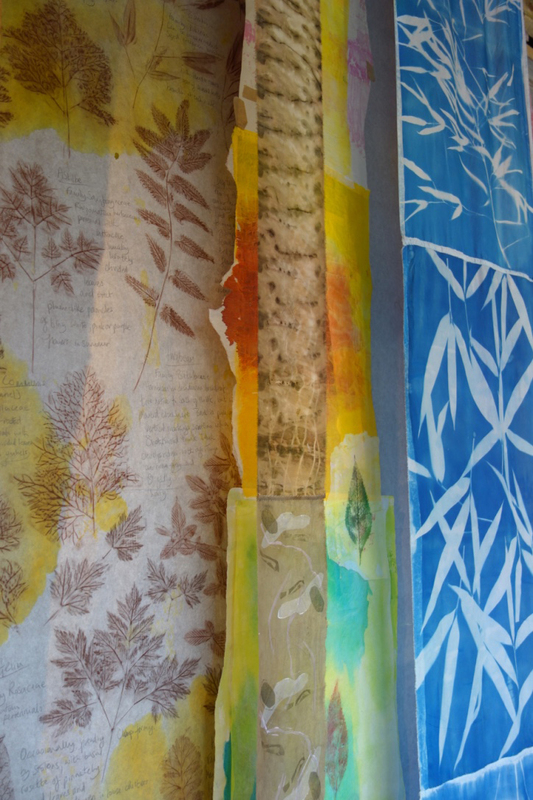 I have been mixing a variety of materials onto cotton rag paper and cotton and silk fabrics. Outcomes in stitch, print based media and collage reflect a sustained interest in the changes that occur in a garden across a year. My aim has been to capture the very essence of the plants, the impressions left through the changing seasons and the warmth and light of the summer sun in an attempt to re-create a sense of the Sussex Prairie Garden. What creative process are you currently working on? A life time fear of dyeing fabric was cracked 3 years ago when I taught myself how to dye with indigo. With lots of practise with the Shibori dye process I became fascinated in learning more about different ways of dyeing fabric. The residency gave me the opportunity to work with nature through the garden plants. Collecting and foraging has been a real feature of the last year. Taking rubbings from leaves, hammering colour out of leaves and flowers, bundling leaves into fabric, steaming and simmering the bundles revealed some real possibilities. I have had to complete a lot of research through reading, watching You Tube videos and talking to local people with fabric dyeing experience to find out more about the process. I am becoming proficient at scouring and mordanting fabric with Allum (a preparation process to ensure that the dye is colour and light fast) and most of my work has involved Ecoprinting. (Contact printing leaves straight onto fabric through bundling, tieing, steaming or simmering in water). My next quest will be to extend my mordanting knowledge by using copper and wood ash in preparation for dyeing and also using modifiers to alter the colours after dyeing. I work in ranges and series all of the time and have at least 3 -4 series on the go continuously. This way of working helps me to keep an experimental approach going. Rather than invest all my attention in one ‘masterpiece’ I float from one series to another. When I return to a series I have a fresh eye, see the work differently and adapt and alter the works. I put a series away for a while and get on with another series and then put tthose few works away. I find that distancing myself from the work in between helps me to see the works objectively when I return to them later. Making all these works part of a journey, an ongoign process has helped me to build confidence in what I am doing. If one work fails it matters less and I can rip it apart and rebuild it without worrying or feeling a failure. Happy accidents occur along the way too which again helps build confidence. Masking tape, PVA glue, knife, paper scissors, fabric scissors, a range of black and white drawing media. Various ways of making colour such as ink, acrylic paint, pigments and selectasine for screen printing and embroidery cotton for drawing. Silk, wool and cotton fabric, plant life for making marks and colour on fabric. I make intuitive responses to things that I have observed around me, first hand, and then I search for creative inspiration within the artworks themselves. Sussex Prairies residency has given me my subject matter. I am now moving into my own garden for inspiration. When I was 16 years old my father said to me: “ if you want to be an artist it will be your job to reveal to others what they cannot see themselves, you will have to find that angle, that viewpoint in things that no-one else has shown us yet.” This conversation has stayed with me as a lasting memory of my father who died when I was 20. He has never left my side whilst I am making things and in my attempts to reveal to others what it is I find interesting about the visual world and my attempts to communicate this to others. When I was 18 years old my art teacher Harman Sumray shared a quote with the class from American Author and poet Carl Sandburg “ I don’t know where I am going but I know I am on my way”. This phrase was a great revelation to me at that early point in my life. The realization that whatever I do in my life and that whatever I try to create it will not be the finished article, that leading a creative life will be a continuous journey of reflection, curiosity, reflection, more experiences, reflection and more making searching for an unknown destination. I am loving this renewed immersion into my making my own work and believe that I will continue my journey. I hope to keep connected with the sketchbook circle, a great way to keep things going. I went to Glasgow School of Art, got a BA Hons Embroidered & Woven Textiles. I didn't really do the fabric thing, much to their disgust and my joy, as I made latex and ceramic heads, all based on the distorted portraits of my friends and family, how I really saw them! Then I was meant to have a job with Jim Henson, alas the recession came. Ended up being a community art tutor and doing loads of art clubs for social services and SEN adults in galleries. I completely loved working with SEN, so decided to train as a teacher, which eventually led me to working in the North East of England in a SEN school. The first couple of years of teaching, I still managed to have exhibitions around the UK, also finding time to learn Photography (darkroom) and continue to develop my love of Life Drawing. Sucked back into the world of teaching, my own art work was pretty non-existent, just loads of demo/samples for work - ended up being a "jack of all trades". Eventually, and I really don't know why I didn't hear about it sooner, I discovered NEATEN and NSEAD, this opened doors up into a whole new way of working/thinking, and most importantly my work/life balance. I started to think about attempting to make my own work again and this is where I first heard about Sketchbook Circle. So last year, I decided it would be good to have a challenge and work small and push myself into the unknown world of collaboration. Unfortunately one of my partnerships completely broke down right at the beginning, but luckily the other one was successful and we managed to develop a good creative conversation. I am now about to start my 24th year of teaching, and I can honestly say that I feel revitalised, and would now consider myself to be known as an artist teacher. That is all down to being involved with NEATEN, NSEAD and of course sketchbook circle, which has allowed me to bring experimental fun back into my own art practice. Basically, anything that is around me may be used for inspiration. This digital circle started with photographs of my trainers and pavements, which I thought was a good excuse for breathing stops as I am doing some running challenges this year. It has further developed on into street and urban landscapes and just recently influenced by a Radiohead gig I was recently at. I regularly carry my camera around and recently just got a Lomography fisheye (film), which has allowed me to experiment with double exposure. This has then led me back into the darkroom to experiment further with more alternative photography techniques. Having recently just started teaching GCSE Photography, I knew that I would need to brush up on my Photoshop skills (digital darkroom), fed up being one step ahead of my pupils. So, when the opportunity got announced to do a digital circle, I decided that I would give myself a challenge and branch out into the unknown world of digital and tackle my lack of digital/computer skills. Do you have favourite apps/software/hardware that you use? I've mainly been using my laptop with Adobe Photoshop for most of this circle(iPad at the side with YouTube on). I have found the "help sheets" that Georgia has sent out to be extremely useful. Completely loved experimenting with glitches, especially when you just press play and Photoshop just does everything for you, seriously really clever! 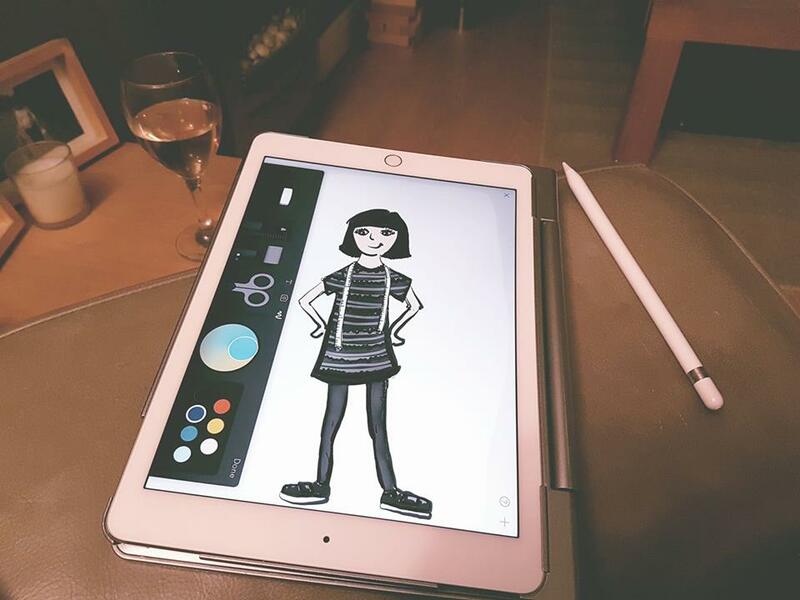 I have just got the Procreate app, under Sarah's recommendation and hopefully will find some time this summer to experiment with this. Like I said earlier, it has brought the experimental fun back into my own art work, at times a cheeky glint in the eye when showing and speaking with my pupils about what I am doing. They have loved being involved in some of the work, happily posing with images over their faces. I am really fortunate to be working with Sarah, as this has also helped to push me out of my comfort zone and made me attempt to be more creative and experimental. For this circle, I have not purely just worked with digital, I have ended up using sewing, sculpting and adding wax into some of my digital images. I have found that we (Sarah and I) have been able to creatively bounce off each other, either being influenced by our use of images, colour or shape to help to develop a natural flow of work. The only thing that is different is how you send your work, but after getting advice, I worked out that Slack was good platform to use. My name is Liz and I am the director of The Foundry Gallery in Chelsea, London. This is my first year doing Sketchbook Circle and I am really enjoying making the time to make work again. I spent 7 years as the Fine Art Lecturer on a Foundation course at Richmond Upon Thames College. There were many ups and downs and sadly towards the end more downs. After having my first son in 2011 I took voluntary redundancy. This coincided with my husband and his business partner deciding to open a gallery as part of their architectural practice and I stepped in. I had to learn my new career by doing it! I joined the Association of Women Art Dealers and went to as many seminars, lectures and workshops as I could. I also won a place on an art dealers boot-camp which taught me most of what I needed to know. As the director and curator (a one man show really!) I am always on the search for new artists whose work resonates with the gallery’s remit of art work that explores the relationships between art and architecture. I do the graphic design, website, contracts, photography, curating and hanging and making good the space afterwards. I am also the writer and editor and put out all the press releases which have had a good track record. Each exhibition takes up to a year to put together as a mum of 2 I have limited time and I like to build a good working relationship with the artists I work with. Currently I seem to have three main threads to my work: one is based on found maps, the second comes from photographs of buildings I’ve taken and then edited on Instagram; editing, cropping and tessellating with the “Layout” app (through Instagram) to create new ‘architectural’ structures. The third is triangles, triangular shaped roofs will be basis of new series of screen prints I’m starting in September. I make my work on the dining room table. I am also working on my trusty iPhone 5 with Instagram and Instagram Layout. From exhibitions I have seen, artists I like, art journals I have read, art books, blogs, Instagram and my surroundings. I start with research then through experimentation and working through an idea. I throw out a lot as I am out of practice and a perfectionist so I am finding the Sketchbook Circle liberating! My name is Suzanne Chalke and I’ve been teaching since 2003, 7 of these years being Head of Department at Hinchleywood school. This is my 4th year taking part in the sketchbook circle and my experience is getting better and better. 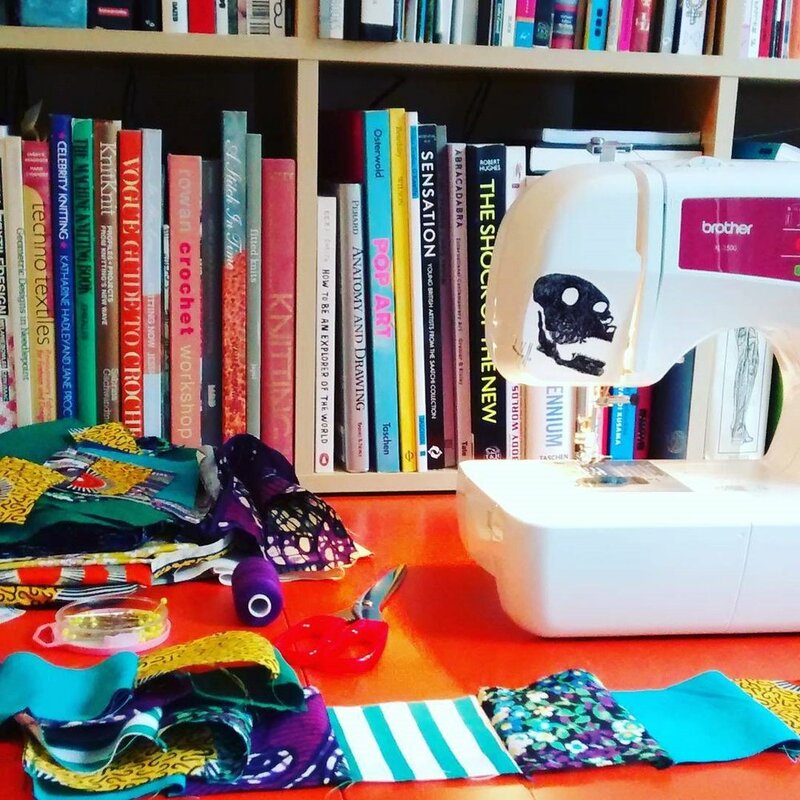 I initially joined up after attending an NSEAD conference and loved the idea of doing something for myself, sharing a book with a neighbour and creating collaborative work. As Head of Department we get more and more swamped with paperwork and deadlines, I felt I had lost my own creative identity. A Sketchbook Circle seemed to me to be the best way of kick-starting my own work and discover what I enjoyed creating and making, it’s most definitely succeeded. It’s taken a few sketchbooks for me to finally rediscover a style of work that I would call ‘me’. My degree was in 2D design - surface pattern, printmaking, textile design, photography and graphics. I would say that I’m still very much in this area and continue to enjoy combing these techniques. At present I am focusing on combining mundane everyday images such as drain covers and road markings with collage, gelli printing and mono printing. I like not being too set in what I do but instead experiment with different colours, layers, stencils and shapes then see where it takes me. I then start playing around with collage, composition and doodling on top. This has taken quite a few years to get to the point of being able to ‘go with the flow’ rather than being worried about ruining a page or getting bogged down in detail and the finished result. Apart from taking part in this year’s sketchbook circle I have recently started an evening class in ceramics. I have never made clay work before and am enjoying learning new skills and understanding more about the technical side. At school, we have recently been successful in our bid for a printing press so I am very much looking forward to further developing this area of my practice. My process either starts with an image and goes from there or it could be techniques based. With my print making I will often use quite graphic images but I also like to create more abstract prints based of colours, shapes and line. Sometimes I will create my artwork in a free at school, procrastinating, and continue when I have my A level group. I feel it’s important that students see their teachers creating their own work, have a dialogue about what I’m doing and share ideas. Quite often they have helped me with my sketchbook circles, 2 heads are better than one. I couldn’t live without my pens, camera and paper. Taking photos is important to me, to be able to capture a colour, texture or shape. To have a moment where something has stopped you in your location and being able to capture it. I also love a bit of doodling as it helps me to stop my head from over thinking, just zoning out and not worrying what you are drawing. For my inspiration, I tend to keep my eyes open when I’m walking about and pay attention to small details that others may miss such as textures on a wall, shapes of shadows on the ground, the pattern in an electrical pylon or the painted lines on a road. I enjoy looking at the mundane of everyday and just being aware of it. Since focusing more on this ideas pop into my head as I’m going to the local shops and then I’ll know what I’m going to create. I also use Pinterest a lot, for school and for myself. Being part of the sketchbook circle has inspired me hugely as I’ve leant new skills in workshops, seen so many good ideas in the Facebook group and from the partners I have had over the 4 years. I have often had to step out of my comfort zone to respond to a partner’s work. What's the best piece of creative advice you have been given? I’m not sure if there has been any specific advice but a collective. I would say it was just to get on with it, start it, not to procrastinate and trust that you are good at what you do. To take some risks and experiment and have fun, see what happens. I try to instill this in my students to varying degrees of success, some relish it and others not so. I believe it all boils down to what Matisse said, that ‘creativity takes courage’. My name is Ben and I currently teach A Level Fine Art in an FE College in South Wales. I have a Degree and MFA in Fine Art so in that regard I've not been too radical in my career choice. I am currently trying to balance my teaching, a young family and continuing to have a creative practice. This means working small and that my sketchbook has taken on an even greater role than previously. I have an eclectic taste but certain themes/processes resurface. These include the figure, faces, continuous line, drawing people who are unaware e.g in cafes or on trains, sewing and embroidery, painting, collage, ink washes, obsessing over my sketchbook, childhood, overlapping and layering and playing with flatness. 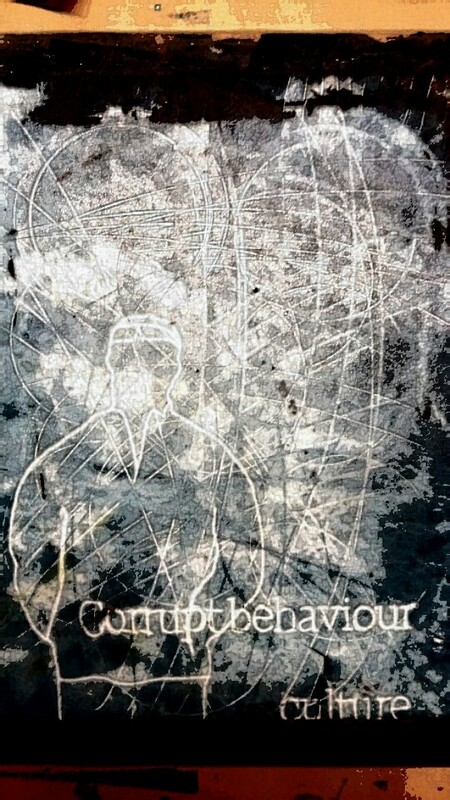 Currently I am trying to improve my printmaking skills having only flirted with it in the past. I have producing a series of Twin Peaks inspired images and this has become a small edition of prints which is a new departure for me. This is also an attempt to see if I am able to produce more illustrative work alongside my more observational/figurative/semi-autobiographical work. I am also considering setting up an online shop; but in this regard I am rather lazy. I predominantly want the opportunity to be looking at someone in front of me; figures and faces are my main inspiration. I find all people have something I want to capture; the clothes they wear, the postures they hold and I see these forms as a series of shapes, lines and patterns that can be developed in infinite ways. Drawing is key for me, I don't think I can be an effective painter or printmaker unless I keep drawing (practice makes 'better' in my case) . I also believe that Art should be playful and that through play we continue to learn - I tell this to all of my students. I start almost all of my drawings using continuous line and cannot recommend that way of drawing enough. So my process is a mixture of play and exploration but at the same time trying to pin something I've seen down. A sketchbook with nice paper (currently it's all about Fabriano), a pencil case filled with; pens, markers, brushes, my embroidery kit, watercolours, material swatches and matt Modge Podge glue - love that stuff! Gallery trips when I can, a bit of Facebook or Pinterest. I have realised and accepted more readily this year that my students also inspire me a great deal - being in a studio five days a week teaching means I am constantly exposed to new processes and approaches to visual problem solving. I am passionate about FE and feel that students at this stage start to make some of the 'good stuff'. I am often asking students to show me how they made a certain surface or texture and later unconsciously it will appear in my sketchbook in some way. I also work with some great Lecturers who encourage me and my family are also very inspiring - I have three daughters and I could draw them forever. On my degree my Lecturer was called Jim (I really looked up to him) he said that drawing is actually about looking rather than copying. The more that you look the better your drawings will become, the time you devote to drawing means in turn you become quicker and the connection between your hand and brain becomes almost instant. It was something along those lines, and I have found it to be true. 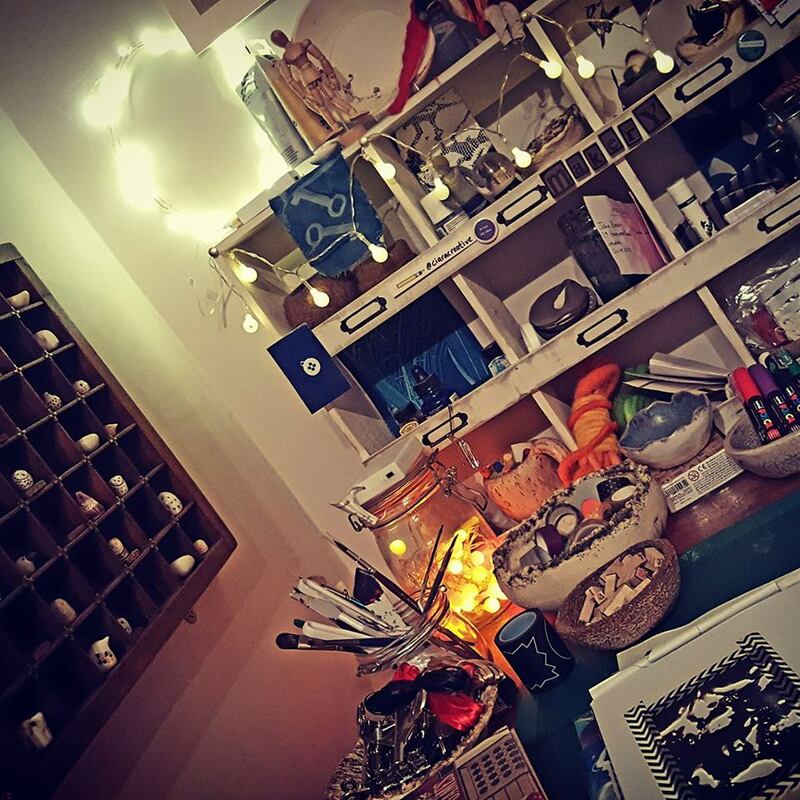 We asked our members to share images of the spaces where they make work with us. The response showed how personal and important these places are, from an iPad, a toolbox and a laptop desk, to large and beautiful studios. 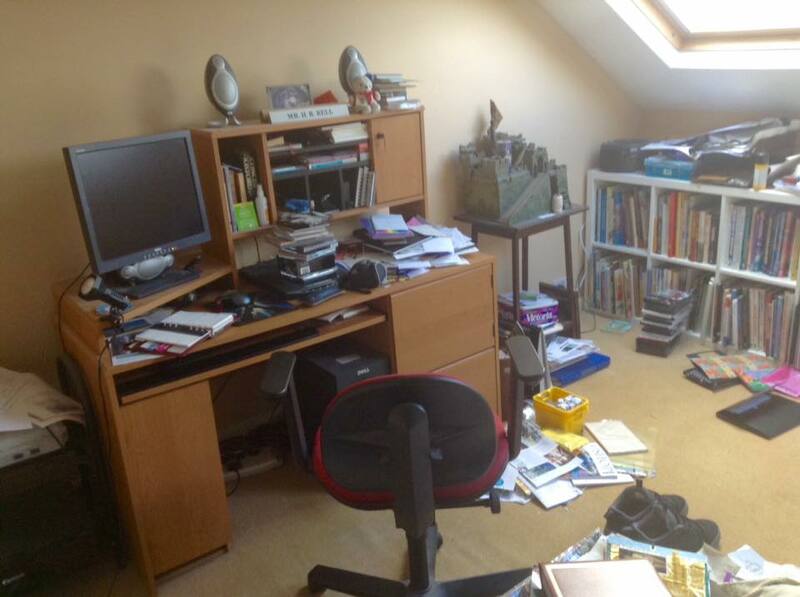 The images reveal how differently we work, where order or (organised) chaos are our preferred ways of working. Thanks to Sue Guildford-Potts, Vicky Charlett, Yvette Hughes, Cherrie Trelogan, Claire Connolly, Elinor Brass, Helen Homewood, Diane Bruford, Jayne Everiss, Ben Meredith, Harry Bell, Tilly McDermott, Sam Hanson, Mandy Barrett, Anne Laurie, Elaine Morgan, Morrighan Humpleby and Sally Jane for sharing their spaces with us. I’m a secondary school art teacher and I live and work in Dublin, Ireland with my partner and 3 cats! I began my career in art as an exhibiting artist for a couple of years after I completed a degree in Fine Art Sculpture. When I undertook a PGCE in 2000 to train as a teacher, I had presumed that teaching would support my career as a practitioner by giving me a sense of financial security. But instead the demands of teaching took over and I slowly lost my engagement with my personal and professional practice. As my identity as an artist took a back seat - so much so that I would consider myself as an arts educator as opposed to an artist teacher – I mourned its loss. Over the years I tried to re-engage with my own art-making but struggled to keep momentum or develop ideas. I completed a master’s in Visual Arts Education in 2014 but as nothing like the Artist Teacher Scheme exists in Ireland there was no hands-on, making aspect for me to get my teeth into. Instead it was purely theoretical and although I really enjoyed researching and writing I still was looking for something to help me start working as a practitioner again. That’s why finding Sketchbook Circle has had such an impact for me. Discovering this initiative has given me a structure to start making and thinking in a valid way once more. How did you get involved in Sketchbook Circle? In the course of my research for my master’s degree I discovered NSEAD. A notice about Sketchbook Circle was on one of their newsletters so I contacted Elinor to find out more. As I was based in Ireland, I wasn’t sure if I’d be able to join but luckily I was so I signed up for the 2016 circle. I really didn’t know what to expect as I had never worked in this way before. Starting was difficult as I hadn’t made any work in so long. I also found not having a theme or starting point difficult so the Facebook page was a great support in starting off. I got inspired looking through the images of other’s books and it was great to ask for advice from others in the circle and also see that I wasn’t alone in feeling anxiety about starting off. Sending my initial few pages off to a stranger frightened the life out of me as I really didn’t feel any confidence about what I was doing. But I needn’t have been worried as I can honestly say that last year’s circle has been the most valuable artistic experience that I have had since college! One of my swaps didn’t work out unfortunately but I had an amazing journey with my main partner Carola Chambers. She was really supportive and positive to the work I was sending her. After an initial visual introduction we started to develop a visual conversation and an interesting and relevant body of work began to emerge. By the time we were working on the second book, I was making work that I was proud of again and the ideas were flowing. I’m so happy to be making and doing again and realise that regular making is more important than what I make. My engagement with sketchbook circle has also been influencing my classroom practice. I feel that a consequence of becoming re-engaged with my own practice has been the re-invigoration of my teaching and this has been reflected in my schemes. Coincidently the art curricula here in Ireland are currently in a state of flux. Assessment changes are in the process of being implemented in senior cycle art and there will be curriculum changes to the junior cycle art programme next year. For the first time in the history of Irish secondary school art education sketchbooks are now going to be an integral part of the assessment process. The current 5th year cohort of students will be the first group to participate in these changes. 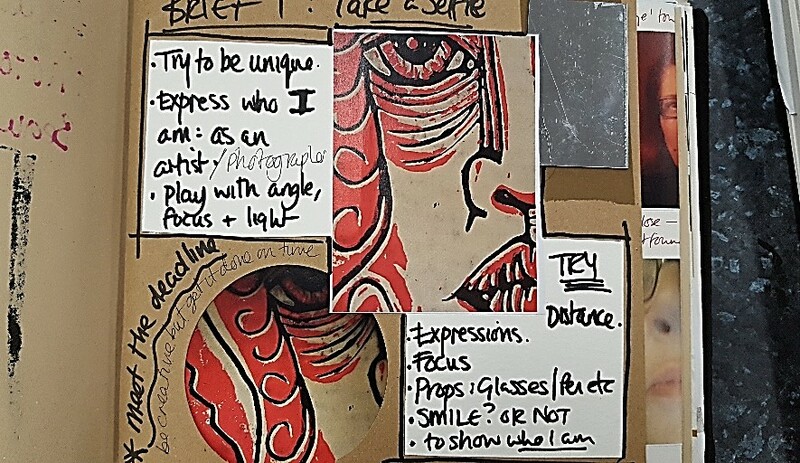 I felt that a classroom Sketchbook Circle would be a great fit for my 5th years and would be a great way to get them used to working in a sketchbook and developing a regular practice. It also has the benefit of making the students more confident about showing and talking about their own work, something there wasn’t enough of. My students love the circle (done as a weekly swap) as it has given them ownership over their work and has been a great tool for peer teaching. I have always been inspired by the figure and this continues to be a dominant theme in my work. 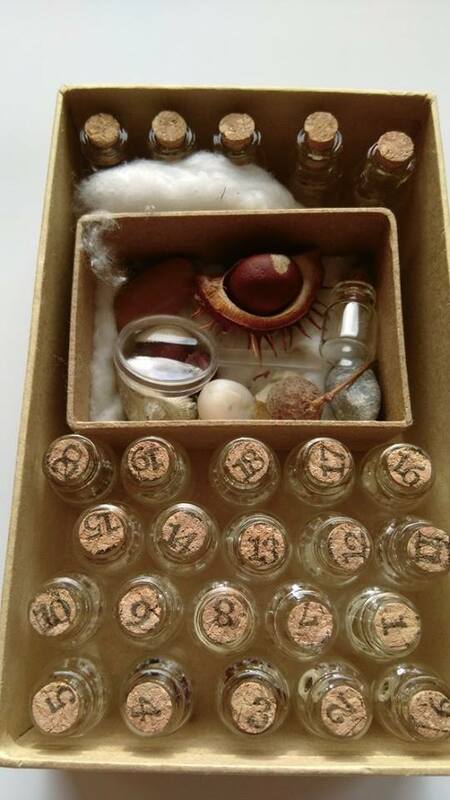 My early work before I became a teacher was installation based and often time-based and site-specific. My central concern was around representing memory and a visual record of everyday relational interactions. The work I have been making recently, as a result of the circle, has resulted in my work developing in a new direction. Through the visual conversation I was having with Carola, new ideas and starting points started to develop and astronomy emerged as a central theme. At the end of our partnership I felt that the work was only just beginning and I have been continuing to work on some of the themes that have emerged out of the books. 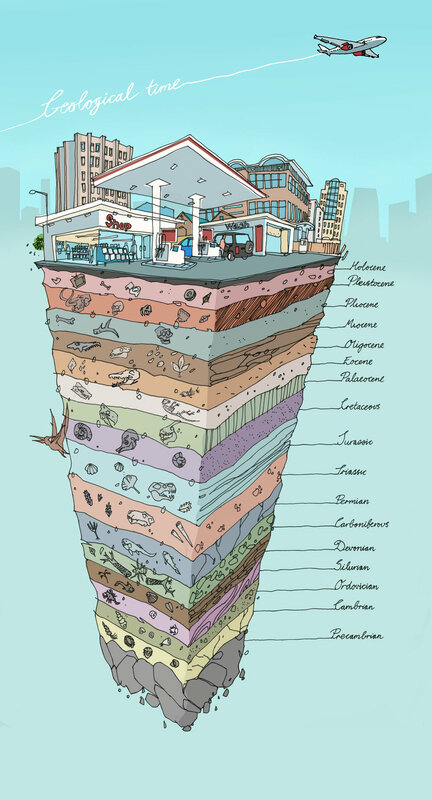 I feel that this is initial research that has the potential to lead to a larger body of work. Drawing has always been and continues to be central to my practice and is the backbone of what I do. Working in the sketchbook format has meant that I have worked primarily with 2D mediums recently and I see this as a main departure for me due to my background in Sculpture. I have been experimenting with paint and playing with collâgé. I have been exploring print – in particular drypoint etching – as this has felt like a natural progression from drawing. As a result of ideas conceived in the sketchbook I decided to hire studio space in a print studio and spent a day working on printing in a larger format. It was so enjoyable to be back in a professional studio environment – if even only for one day – and make work. Interestingly, some of the themes from my earlier work have been creeping their way into my current work and they seem to be finding homes in my new working practices. Everything and anything! As I’ve already mentioned the figure remains a major inspiration. I have always had a fascination with empty/abandoned spaces and I’ve always been captivated by shadows. Over the last number of years I’ve developed an interest – at an extremely amateur level - in astronomy and my reading around this topic has started to inform my current work. 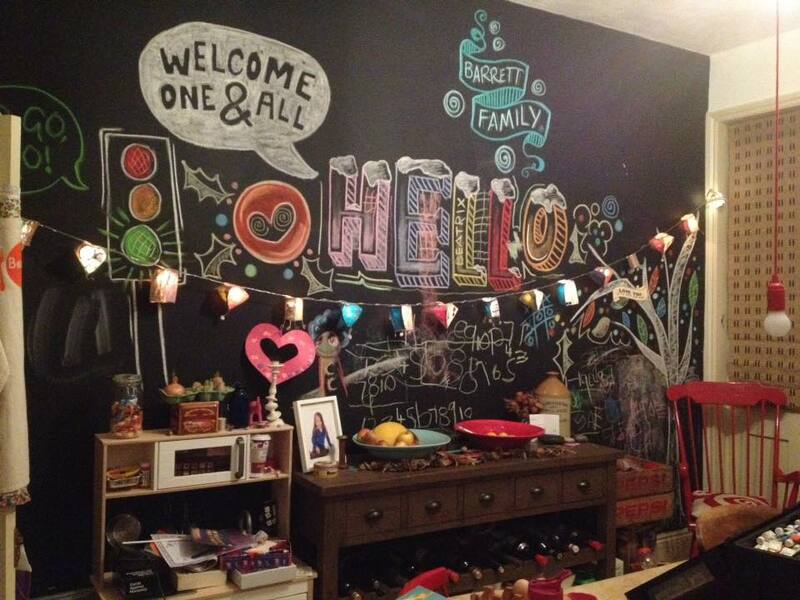 Tell us about the space you use to make art. I generally make work either in my classroom in school or at home on the dining room table, it all depends on what time I have to hand. I love working in my classroom because of the space, access to materials and tools such as a small printing press. I like to work after the school day when everyone’s gone home and I’ll be undisturbed. If I’m working at home I usually take over the dining room table for a couple of hours. I’d love to have a studio space in my house that I could just leave everything out after a session and not have to tidy everything away while I’m in the middle of something. When do you find time to make work? Finding the time to make work is the biggest challenge in maintaining a regular practice. I seem to be regularly time-poor as a result of juggling teaching and personal commitments. However I think that’s one of the most important benefits of the Circle. It motivates you to find some time – no matter how small – on a monthly basis. Knowing someone’s waiting on the book is a brilliant motivator - deadlines have always been an important tool for me in making work. Some months I do very little and other months I may have more time and do more. Once I’m actually sitting down and doing, it spurs me on to find more time to do more, but unfortunately there’s never the amount of time available to me that I’d like to spend on my work. I’ve been developing some textile pieces that came out of ideas from my work with Carola. I had been playing with layering images which lead me to layering text using embroidery. This work conjured the motif of a veil and I’m currently researching the symbolism of the veil both historically and culturally. This is very much work in progress which I hope will grow into more formalised pieces. When I started my new 2017 swap, I initially thought that I would continue this work into the new swap, but in the end I felt that I couldn’t start a new swap that way and that it would be out of context. There’s a strange disruption about finishing a swap and starting a new one. This year I’m working with just one partner. 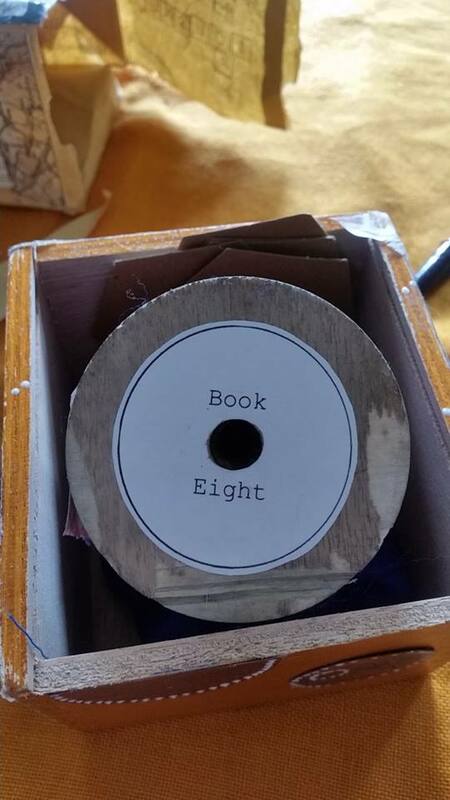 We’ve been working on a book each and have decided to swap them every two months. I’m excited by what my new partnership with Petra Matthews Crow will bring and interested to see if the ideas that I had been working on will creep back in to this new book. What art materials can you not live without? I couldn’t be without fine-liner pens and always have them with me, I just love drawing with them! I am a mother of two and have been an art teacher/head of art for sixteen years in various schools in the U.K. Last year I did the Artist Teacher Scheme at Birmingham University which led me to change direction in my career and go into working in inclusion; I am currently setting up an inclusion space at an inner city school and work with disaffected teenagers. My work is quite experimental and is often a response to 'place' and the residue left by our interaction with it. I like to push my use of drawing beyond the traditional mark making media and have used shadow, thread, projection and ice to create pieces of work that are intended to be temporary. I am inspired by the ordinary, the marks that people don't always 'see'.....eroded walls, road markings, rust, shadows. The direction of my work is also fuelled by collaboration with others, this interaction gives me a push into the 'unknown' and will often steer the way that I respond to an idea. I have been involved in the Sketchbook Circle since 2012 and it is interesting that my first collaboration with Elinor Brass is still feeding my preoccupation with making a response to 'place'. I also like to make work that can be left in situ to be found, so have regularly made pieces of work for #freeartfriday to be discovered and taken home by a stranger. I like the idea of using art to make the unnoticed noticed. What materials can you not live without? As a screen printing graduate I am always drawn back to using print in my work, so the answer to this would partly be printmaking ink. However the direction of my most recent work has become more digital so I would also have to add my IPad to that list! The tool that I use most though is my iPhone, for capturing initial images to projecting using a mini projector and also, most importantly, in sharing and finding ideas with others using social media. When do you find time to make? This is tricky as I work full time and family takes up most of my time outside of work. I used to make art at school in my lunch break when working as an art teacher. I found the Sketchbook Circle model worked for me as I would often 'hold' the dialogue in my head until there was an opportunity to make work. So producing work then, and now, often happens in intense snatched periods of half an hour here and half an hour there. I have found that this has also had an impact on how my own work has developed as I cannot use lengthy processes due to the time restraints. My children are quite often my art 'sidekicks' and will come along when I drop work to be found, or when I am drawing they will join in! At the moment either in my garage or if it is digital drawing, in bed last thing at night! I did rent a studio for a short spell of time but found that I didn't get time to go often enough to make it worthwhile. I tend to be quite prolific and full of ideas and in talking to another artist prior to doing the Artist Teacher Scheme, he told me to 'cast my stone and follow where it rolls'. When I was on the course I think I was hoping to find a definite 'answer' to what my work is, but I've come to realise that actually there is not one fixed answer. So I follow the advice in that I let the journey unfold whilst being mindful of my gut instinct when making a response. Also, having other critical friends who understand your artistic intentions and preoccupations is invaluable to the process of making art and that keeps me steered in a more focussed direction as well. At the moment I am finishing a project called 'Brindley Village' which is about a derelict village site which is now forest. I have used a bursary from AN Artists to work with artist Bo Jones in developing projection drawing and am currently in conversation with a former resident of the village about co-curating an exhibition about the place. 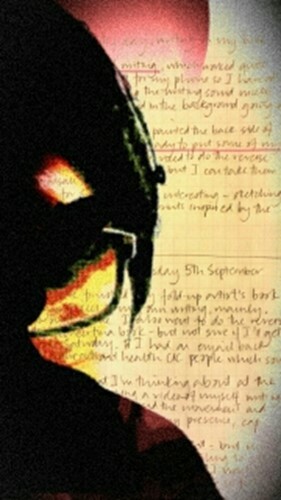 My next project will be informed by collaboration in the digital Sketchbook Circle; I am currently using digital drawing to capture the process of working with pupils who have SEMH and Attachment Disorder and the emotional residue that is created through the projection and 'containment' of strong feelings. I am looking forward to sharing work with the talented Louise Clazey and Claire Kennedy. I am also planning to be involved with a group of artists I worked with last year in a project called #dis:placed in co-editing a newspaper publication about experimental drawing practice. This will be another exciting opportunity to collaborate with David Smith, Stephen Carley and Sarah Wills Brown. So, altogether an exciting year ahead! 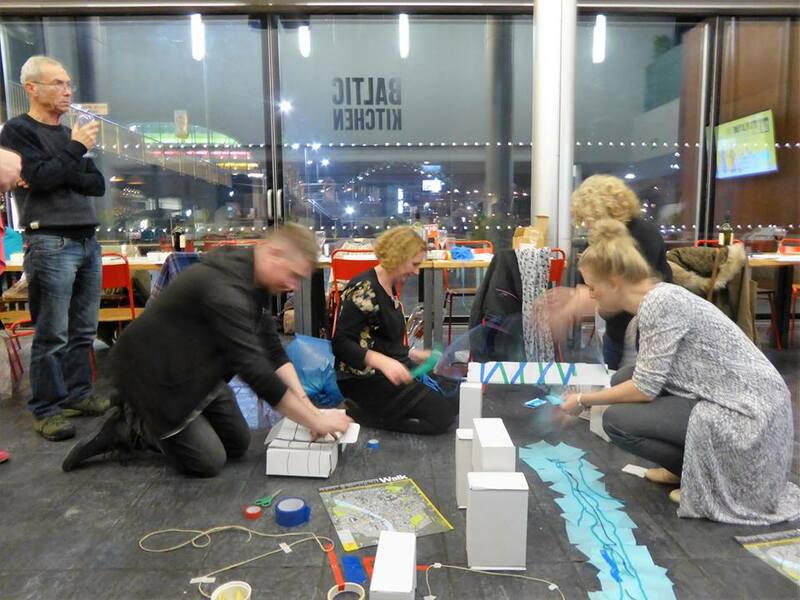 The NEATEN (North East Art Teacher Educator Network) Sketchbook Circle residential took place at Baltic Centre for Contemporary art on 28th/29th October and the majority of people attended both sessions. On the Friday night we welcomed everybody with a glass of wine and drawing activities, as we sat in the downstairs cafe at Baltic, gazing out onto an incredible sunset over the Sage Music Centre and Tyne Bridge, followed by the twilight twinkling lights of the famous Quayside and Mill Bridge. I facilitated the evenings drawing activities- we started with drawing our "lives"which really broke the ice when people paired up and shared. This was followed by a quick sketch of your partner followed by a semi collage drawing developed from that using facila features from a bank of images. We were served with delicious homemade soup and bread, and encouraged to enjoy another glass of wine. t was great to have the whole space to ourselves and work with partners and larger groups to get to know each other. When people had to show how they had reached Baltic, by running around the map, proved to be quite hilarious! On the Saturday we all had a choice of two of the four workshops on offer. Yvette Hughes shared her enthusiasm and experience of making zines and framed this beautifully within the context of making for pleasure and enjoyment. Her collection of resources are impressive, right down to the old typewriter and other novelty ways of mark making. Yvette also had the idea of us starting the day with a Saturday swop shop where we all exchanged ephemera to use in sketch books. 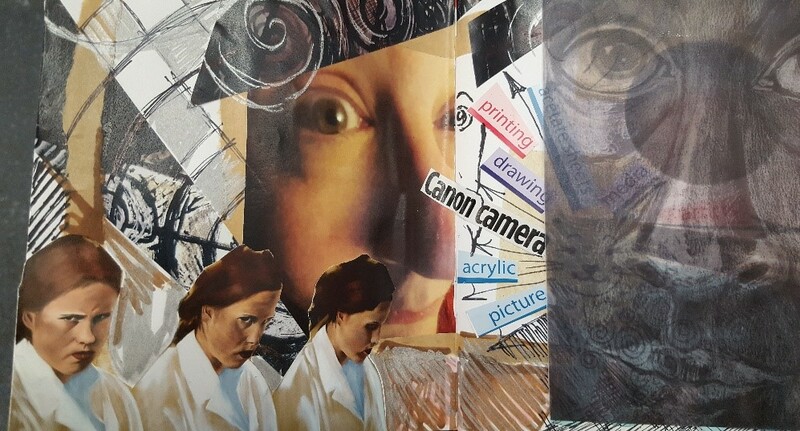 Meanwhile, Gemma Roche and Anna Ramsay were busy on their workshop which was about breaking the creative block barrier, with some shared work where the group used a variety of materials to develop pages which were then passed onto the next person. They created a pace for this which allowed much creative sharing to take place. After a simply gorgeous lunch, overlooking the River Tyne and the Quayside, we started the afternoon workshops. Louise Clazey introduced us to encaustic wax techniques and encouraged people to recycle data records as part of this- destroy and create- from something we don't particularly love! The results of "art Data Anomalies" session were both diverse and very personal. Paul Raymond really got on board with the Big Draw STEAM theme, with his workshop on Weapons of Mass Creativity. 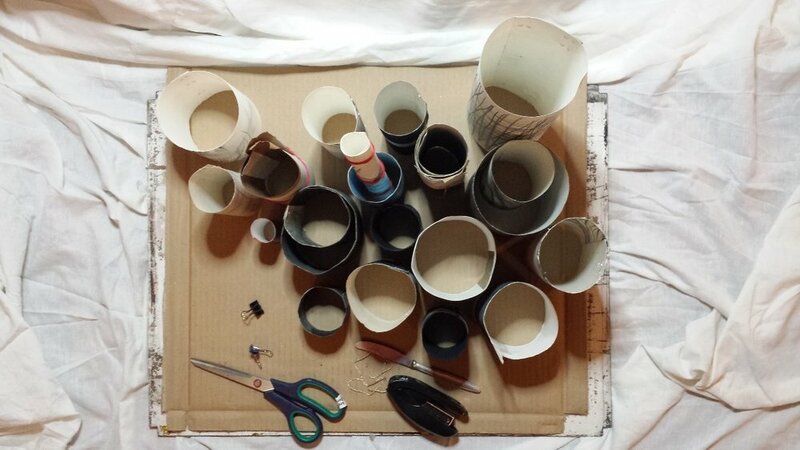 Making projectile firing catapults to create a group artwork was the best fun I've had on a weekend for a long time! Art, Design, Engineering, assemblage and performance- all in one workshop. The final piece was a performance which all the group came along to watch. We ened the day with a plenary and feedback session before people packed their bags and headed off, some to their journeys home, some to their hotels and some of us just to wander around the gallery spaces as the sunset once again lit up the space outside. Baltic are partners to NEATEN and have supported us and Sketchbook Circle throughout, we have plans for NEATEN's ten year anniversary next year and will be creating more opportunities for artist educators to collaborate and create together and embrace Big Draw and Sketchbook Circl as part of that. Thank you Baltic and Vicky Sturrs, Louise, Paul, Gemma, Anna and Yvette. Elinor Brass is an artist, researcher and teacher, Head of Art at a school in South East London, Director of Gerald Moore Gallery and founder of Sketchbook Circle. I am interested in surface, layer, colour, history. My work has tended to be responding somehow to the urban world and to places that show the traces of human life. But not the figure. I am interested in implied stories of what might have gone on, but mostly about the beauty in the overlooked - the everyday. Over the years I have taken so many photos of old walls and abandoned or forgotten spaces that I continue to return to for inspiration. And I do like a good building site. I suppose I would call myself a painter but I work with a mixture of media and methods and often into 3D. Whatever feels right. I draw a lot. I use my camera too. I stitch and I use printmaking as a way to create layers. I didn't study art at as an undergrad nor do a foundation mostly because my experience of art at school wasn't good and at the time I didn't understand what art could be. So I ended up studying History of Art and History before my PGCE in Art and then did a Masters in painting once I was teaching. It has meant that I have had to learn a lot of techniques through teaching myself. In recent years I have often collaborated with another artist, Emily Orley who is a lecturer at Roehampton University. We are both interested in the history of spaces and have explored ways to respond through developing installations in places we found around London. We begin the projects with the idea that 'places remember events' (words that James Joyce scribbled in the margin of his notes for Ulysses) to investigate and document the sites. We spend time researching the place and then develop artwork back into the space responding to the history of the site. 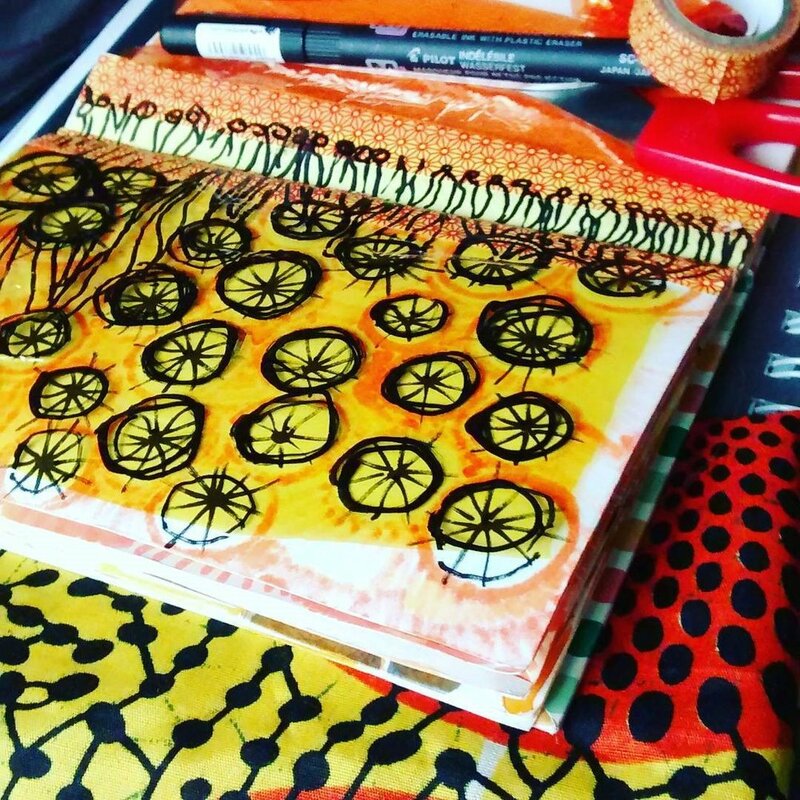 Sketchbook Circle enables me to keep my making processes constantly moving and I am lucky enough to have a space at home which acts as a small studio. It means that the lines between life and art are blurred but that is the way I prefer it. At the moment, I am in the forth year of an Educational Doctorate and so I have not been making big work or working on big projects as much of my time is committed to my research. However, I continue to make every week somehow as it keeps me well. I also consider my role as Director of Gerald Moore Gallery as a kind of artwork. The gallery opened in 2012 and since then I have been leading the programme of exhibitions and events. It has allowed me to commission work, to work with artists, galleries and curators and to explore different ways to use the gallery spaces and most importantly to place learning at the centre of everything we do. I was lucky enough to do my Masters in painting on an artist teacher course at the beginning of my teaching career that meant I could still work full-time. Studying and teaching forced me to develop a discipline towards making work that I have managed to sustain and is kind of where the idea for Sketchbook Circle came from. There isn't ever enough time! But I find the more that I make the more that I am thinking about making and the easier it is to dip in and out of making. I don't wait for inspiration or to be in the mood, but just book in time to make sure that I keep things moving. In my little studio space I have lots of materials that I like using and to which I often return. I tend to get ideas moving through working small initially and using materials that I am confident with and then I build from there. I am always telling my students that they need to see what emerges and I suppose I would say that this is what I like most about making work. In life generally I am quite organised and I like a plan! But I also like to be flexible and reactive which I suppose comes through in my work. I like the way that Sketchbook Circle throws new things into the mix so that I am always developing as an artist and not only doing what I know. I absolutely always carry a notebook. I have lots of art books and a few favourite to which I regularly return. I love going on courses that push me around a bit and make me reflect more deeply on my practice. I use my camera to collect ideas. I have a folder of collected papers to which I am constantly adding and which comes on all of my travels. It is made up of old work, coloured tracing paper, scraps of vinyls, graph paper... 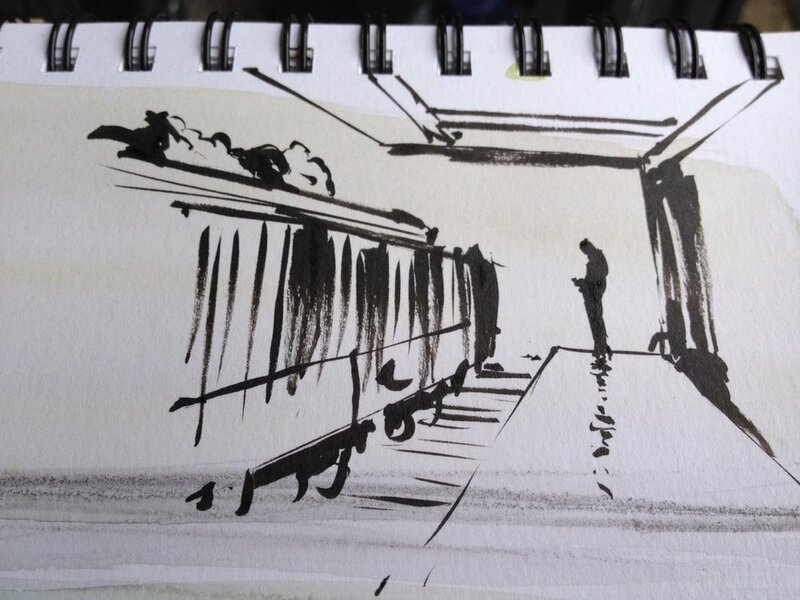 I really love drawing when I am travelling and so I also have plenty of different pens that allow me to build up surface as well as to work in line. I love working with Posca Pens and have recently bought some more deliciously coloured Liquitex paint pens. I also have a stock of washi tapes that I take with me. Over the years I have stockpiled tester pots of emulsion which I use a lot in my work but recently have been using alongside lots of vivid drawing inks, bright acrylics and a range of fabulous Liquitex spray-paint. I have also been working a lot with Gelli plates in order to develop surfaces and like the immediacy of that and the fact I can work quickly and be reactive. I have lots of brown paper sandwich ties from Italy that I always get when I go to visit! 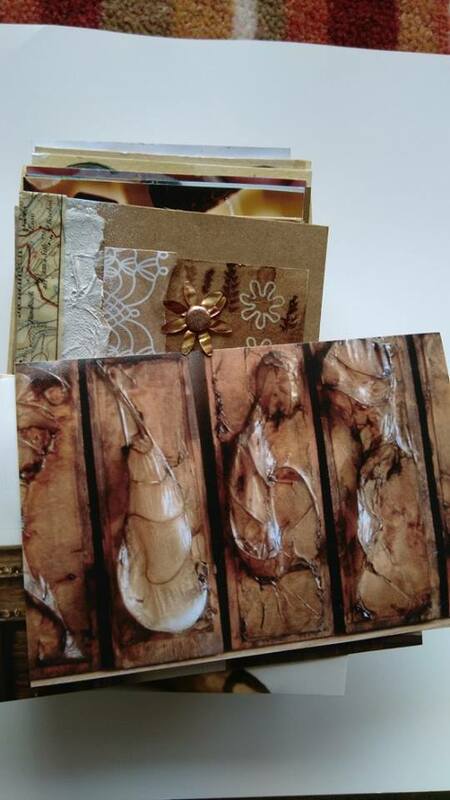 I love using them as a way of drawing and I move into 3D playing with sticks and card and a glue gun. With my doctorate coming towards the end, most of my energy is devoted to that when I am not at work. I chose to do it in order to make the most of my role in the gallery as it was such a big project and I felt quite isolated setting it up. I wanted to make sure that it was a success and had to learn very quickly how to run a business, to develop a vision for the space, to programme events and to get as many people on side as possible! I have benefited enormously from the support of my supervisor, Claire Robins at the Institute of Education. She has given me a great deal of moral support, as well as given me the confidence to try new things and to stand up for what I believe in. At the moment I am exploring being an artist, researcher and teacher within my own institution and considering the impact of the galley on the students I teach. I am hoping that I can complete my thesis by the end of 2017. I went on a creativity course at The School of Life in London which was led by Michael Atavar, who wrote 'How to be an Artist'. I love going on courses like that as I am a bit greedy to learn new things and to carve out time to think about being creative. One thing that he said was to not use the fact that you haven't got the space, time or money to do what you want, but instead to use what you have. To turn it into a positive. I think we are always doing this in schools anyway with the limits of time and funds, but I really like the idea of applying it to my own practice and I find it pushes me harder and I think I am a better artist as a result. It kind of cuts out the opportunity to make an excuse about not making. At the moment I am working small as that is what my space allows for, but in a way I think the work is more developed than it would be if I was painting large canvases. It also suits my life at the moment. The other thing Michael says is 'The only way to start is to start'. Which I am often telling my students. I am an advocate of using your body and creating energy to enable the work. The most perfectly formed idea isn't going to emerge from nowhere. Making work involves the right sort of energy. I am thoroughly enjoying running the Sketchbook Circle and would love for that to become an even bigger movement. It would be wonderful to have the funding to work with more of those involved to run the circle: developing resources and a publication, offering on-line courses, more CPD, more support generally. I really care about the circle but want it to be the best it could possible be. No light reading for me at the moment! I have been using a book called: 'Teaching Art in the Neoliberal Realm. Realism versus Cynicism' edited by Gielen and De Bruyne, which is really satisfying to read as it gives such a clear account of the challenges we are all facing in school over the last few years. But I am also using 'The Wander Society' by Keri Smith quite a lot at school and love Stephen Fowler's beautiful book on rubber stamps! Oh and the 'Photographers Playbook'.